We'll just say it: bigger is better. And the peanut butter egg is clearly bigger than the peanut butter cup. Sure, both the egg and cup have chocolate. But, let's face it, you're there for the peanut butter. If you weren't, you'd just have chocolate -- and, we'd hope, better chocolate. Because the chocolate in a Reese's cup isn't that good. So we separated the peanut butter fillings from both an egg and a cup and weighed them. The egg is bigger overall, so this is not surprising. But what also matters is the peanut butter to chocolate ratio. And again, in this regard, the egg is superior. On the AOA FB page, Erin argued that the peanut butter/chocolate ratio is wrong in an egg. 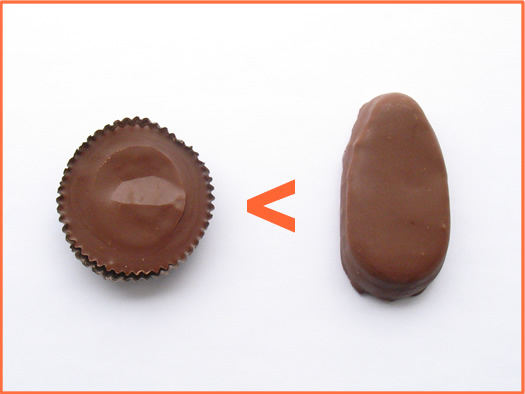 But we maintain that any peanut butter cup or egg that is less than half peanut butter is an inferior offering. That said, we must acknowledge that Reese's is endeavoring to change all this by introducing items like "peanut butter pumpkins." Such items are obviously an affront and should be avoided. As we have shown here today -- through both physical fact and psychology -- the peanut butter egg is clearly superior to the peanut butter cup. And if you already thought this -- as any reasonable person would -- we bid you to enjoy one this weekend with the smug satisfaction in knowing that you were right all along. Whew, I thought I was alone in thinking this. I was just contemplating this last night as I finished off my last peanut butter egg. It's all about the peanut butter, which even seems a little different (better) texturally in this form than a typical peanut butter cup. Also, no data to support this, but I also will argue that the Twix eggs are better than regular Twix bars. Something about the caramel and cookie ratio--but that's another story. I'm sorry, but no claim to superiority of a confectionary has merit unless backed by a thorough analysis of ROCI -- return on candy investment. ROCI is a performance measure used to evaluate the efficiency of a candy purchase or to compare the efficiency of a number of different candy purchases. To calculate ROCI, the benefit (return) of an investment is divided by the cost of the candy; the result is expressed as a percentage or a ratio. In the confectionary sector, one should accept no less than a 15 percent return. Respectfully disagree, though I do appreciate the egg being bigger. What you said about the chocolate (youre not there for the chocolate, if you were you would have better chocolate) also applies to the peanut butter. 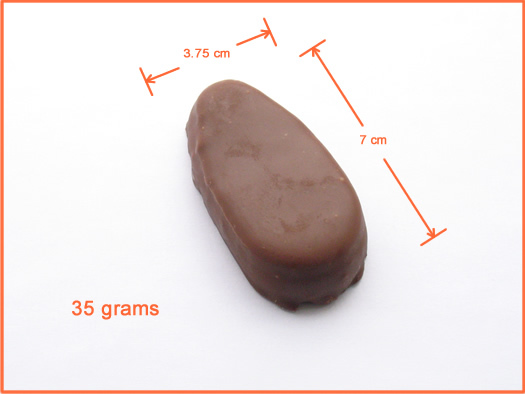 To me a peanut butter cup is all about the ratio of peanut butter to chocolate, which is different in the peanut butter-heavy eggs. it's intense, right-in-the-trenches research like this that make me love AOA. How this has never been debated before is beyond me. Another masterpiece in AOA ! Now that i am home, and without transportation you have awakened another craving for me tonight. Guess i'll just have to mix some chocolate chips in the peanut butter. Erin, I got your back. The egg ratios are out of control. Not only that, but the egg chocolate texture is missing that chunky outer ridge that adds to the cups' delicious superiority. All this aside, when are you hiring? Anyone with respectable taste buds can tell you the egg is far superior to the cup. What I'd like to see tackled is the one going debate over the Reese's Egg vs the Reese's Tree. I would imagine it would be a much closer race to the finish but the Egg would come out on top. as a child i loved these things. as an adult i think they taste like chemicals. both are inferior to dipping real chocolate in real peanut butter. sorry for the buzz kill. but excellent laboratory analysis. There is one critical measurement you have omitted: height. 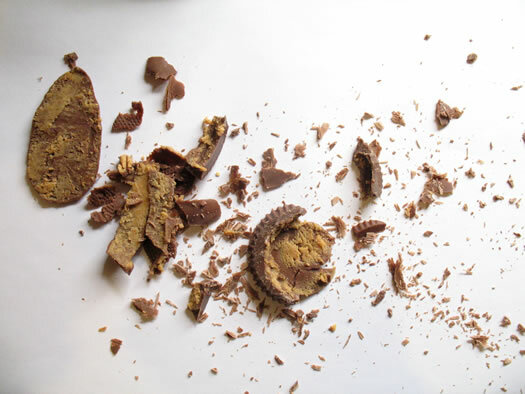 It matters, because while there may be many ways to eat a Reese's peanut butter cup, the absolute best way is to first nibble away the nasty ridged chocolate around the rim. That leaves you with the heart of the pb cup. As you said, the point is the peanut butter. 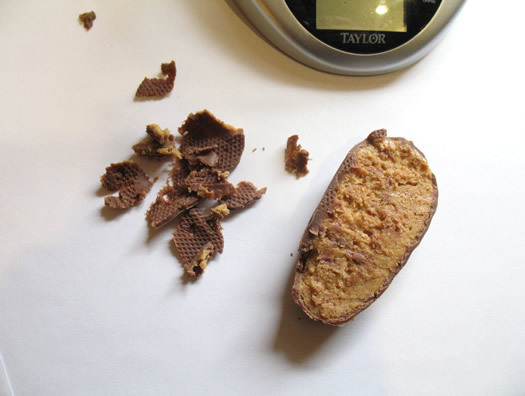 But at the heart of the pb cup is just a narrow slice of chalky peanut-butter-like-substance sandwiched between wafer thin layers of something that's masquerading as chocolate. 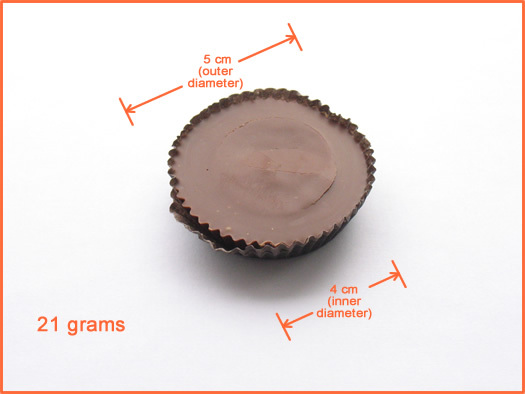 Those who have argued the supremacy of the proportions of the pb cup are right on. The unholy peanut butter egg gives you a bigger mouth full of Reese's peanut butter than anyone should ever have to bear. The egg is great, it's special and seasonal, and exciting to find on the shelves this time of year. It's an elliptical delicacy, but let's remember, it's a show horse. There's a reason that the day-in-day-out real work horse behind the reese's peanutbutter/chocolate brand is the cup. Scientifically, the ratio in the cup is more right, and the ridges are really fun to eat. The cup really deserves the edge here. Thanks for doing this important work and proving what I had always known to be true but could never articulate why. I vote for the cup. I DEFINITELY think the PB egg is MUCH better than the PB cup. The texture is different. I look forward to having the PB eggs all year long. They are better than the PB Santas that are out at Christmas time or the PB Pumpkins at Halloween. The Easter eggs are THE BEST! AOA, this is why I love you. The peanut butter egg is far superior. The thickness of the egg is what makes it. I've taken a liking to putting these little gems in the freezer and then nibbling on them rather than devouring them in two chomps. Delicious! Also- I think I speak for the egg lovers when I say that this has nothing to do with the quality of the peanut butter. We are certainly not under the illusion that this is top of the line. Have you ever had anything that texture or taste in a jar? I'd guess not. I enjoy a high-quality peanut butter, but when it comes to seasonal confections like these, give me the cheap stuff! The real or homemade chocolate with the real peanut butter tastes like just that-- chocolate *space* peanut butter. When you bite into one of these guys, the two blend seamlessly like one gritty little taste of heaven. I know I am late to the party but I feel the peanut butter in candy, in general, tastes better than peanut butter from say a jar. It almost seems like the peanut butter has something extra in it to make it fluffy instead of thick. This is the greatest thing I have ever seen on the Internet. Thank GOD this has been written. This has been an ongoing argument with my husband for years. Now I have my proof. Thank you! Maybe this will shut him up. My hubby and I were just discussing this. We are in our 40s. He doesn't know such a thing even existed. While searching for proof to support my egg superiority claim, I came across this article. What a gem. The peanut butter texture is better. The Pb:Ch ratio is better. The packaging is happier. I would also be a fan of an egg with a ridged edge that maintained egg ratios. My fave would be dark choc Reese's. @mg: Not sure if Reese's makes one but Justin's definitely does, and they are peanut butter cup perfection. I've found them at Price Chopper, Hannaford, and the Honest Weight Coop in Albany. Isn't it Sweet across from St. Peter's has dark chocolate cups and more. I agree, the Egg is better than the original cup....and I like them best of all the Reese's products...because the chocolate used is not the best of the Hershey's chocolate, and I don't know why. It's called a "Reese's PEANUT BUTTER ______" for a reason. The more peanut butter the better. I agree with everything in this article. I tried a Reese's peanut butter pumpkin today cause they're on sale after Halloween, and after my first bite I could not stop thinking about how much better the egg is. I knew they tasted different, I just had to google it and make sure. Lol thanks! I know this comment is going to sound like sarcasm but this is exactly why I love this site. I trust alloveralbany to support their reporting, even on goofy stuff like this, more than just about any other news source.